MR Patrick (Pat) Watterson, husband to Patricia, father of five sons and two daughters, and a loving grandfather, died peacefully in hospital on Saturday, June 16, surrounded by his family. He had just turned 79. 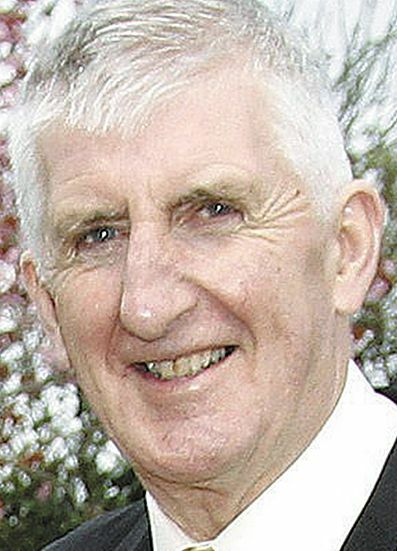 Having lived all his life in Downpatrick and spent most of his teaching career as headmaster of a small primary school in the coastal townland of Kilclief, Pat was a man rooted in the particular beauty of the Lecale peninsula and shaped by a lifetime’s connection with its people and places. Pat was born in 1939 to William and Susan Watterson and grew up on the family farm at the Old Course on the Ballynoe Road, just outside the town. He had an older sister, Mary, two younger brothers, John and Joseph, and two younger sisters, Frances and Clare. Pat was later to bear the sadness of losing his three sisters to cancer with his typical quiet fortitude. He went to school in the town, following which he studied at St Joseph’s Teacher Training College on the Falls Road in Belfast. After a brief period as a teacher in Ardglass, Pat began his 33-year career as head teacher of St Malachy’s Primary School, Kilclief. Although he taught years 5 to 7, his gentleness and affinity with children of all ages was to create in the school an atmosphere of warmth and friendliness, in which learning was also about respect for others, charity and community values. Motivated by his love of the natural environment, Pat also inspired in his pupils an awareness of and respect for the beauty and detail of nature, the changing seasons and the coastal life of the Kilclief area. Pat was not just a headmaster at Kilclief; he was the unofficial bus driver too, with his morning commute punctuated by numerous stop-offs to collect little ones, so that, by the time he arrived, his old brown Renault estate was jam-packed and heaving with quite a few of his own children and many more besides! It was through shared car journeys to school during his very early years as a teacher that Pat was to meet his future wife, Patricia (née Mullis), also a teacher. They married in 1969 and were to spend over 49 happy years together, which brought them seven children and 13 grandchildren. They both retired in 2000 and, in the years that followed, enjoyed regular visits to Donegal and Dublin together, spent sunny weeks away in their flat in Spain and, in 2002, walked the Camino de Santiago together. Pat was a loyal supporter of Patricia in her many charitable ventures, which saw him travelling throughout Ireland with her as she walked to raise money for cancer charities. Pat had a lifelong love of Gaelic games. In his earlier years, he had captained the senior football team at Downpatrick’s Russell Gaelic Union, but, as Kilclief’s local headmaster — known to many as “the master” long after they or, indeed, he had left the school — he was to become a key member of the local Ben Dearg GAC. He served on the club committee and was a tireless supporter of juvenile players’ development in hurling and football for many years. The Park at Kilclief was his second home and the club members like an extended family. On many a summer evening, Pat was to be seen there, perhaps training with “the wee fellas”, marking out the lines of the pitch or enjoying a chat with friends. Pat’s influence and service in Gaelic games were to reach beyond Kilclief. He became a member of the county hurling board, the local féile committee and the Cumann na mBunscoil organisation, making many lifelong friends along the way. But, where Gaelic games were concerned, it was not the organisation or the positions of influence that Pat enjoyed the most; it was the thrill of the game — the speed and skill of a hurling match, the points scored, the near misses, the sportsmanship and the pursuit of excellence through practice and dedication to the game. It didn’t matter to Pat what club you were affiliated with — when you put on the jersey, you gave it your all. Pat felt most at home in nature, whether in the back garden or on the beaches and byways of the Lecale peninsula. He derived a lot of peace and contentment from the simplicity of a walk in a well-loved place, among them Minerstown beach, Toberdoney (near Castle Ward) or the family fields at Ballyorgan (near Bishopscourt). These were some of the places rich in personal and historical significance to Pat, criss-crossed over previous centuries by his ancestors and redolent of happy childhood days helping on the farm or playing with his siblings and cousins. Pat was not a man burdened by the need to compete for attention or to prove himself to others. He wore his intelligence lightly, effectively conducted various leadership roles with a low-key informality that put people at their ease and was much more interested in finding out how other people were than in talking about himself. He was first and foremost a family man, never happier than when surrounded by his large family, watching his children and grandchildren grow and enjoying the craic along the way. If the turnout at Pat’s wake and funeral are anything to go by, he touched the lives of many in his community, young and old. A guard of honour composed of past and present Ben Dearg GAC members and the children of St Malachy’s PS lined the avenue of St Patrick’s Church, Downpatrick, where his funeral mass took place on Tuesday, 19 June. At that mass, Canon Noel Conway concluded his eulogy by saying, “Pat was the best”. Many others have referred to him in recent days as “a gentleman”. Pat probably would have shrugged off these tributes, being self-effacing to the end, but the evidence of his wonderful qualities will live on in the many family members and friends who feel so very much the richer for having known him.